PGCBL Assistant to the President Justin Mattingly has been awarded the 2015 DeVesty-Williams Scholarship, given out by the Syracuse Press Club. 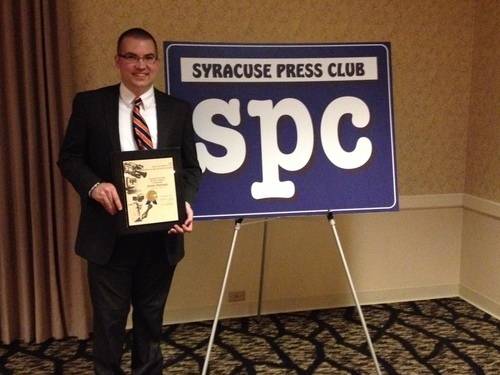 The scholarship, which is given to one, full-time undergraduate student who is studying print, broadcast or digital journalism at a college/university in the Syracuse Press Club service area, was awarded at the annual Syracuse Press Club dinner on May 2. Mattingly, a resident of Philadelphia, New York, is currently a sophomore studying newspaper and online journalism and political science at Syracuse University. "We are elated that Justin has been recognized by the Syracuse Press Club. We expect that this will be one of many awards and accolades he receives for his journalistic endeavors,” said PGCBL President Jeff Kunion. “The entire PGCBL family sends our congratulations." The scholarship was given out based on academic achievement, involvement in extracurricular activities and work experience, a personal philosophy statement, media samples and professional references. Mattingly is currently the news editor of The Daily Orange, the independent student newspaper of Syracuse, New York, among other extracurricular activities. Mattingly is currently in his second year with the league.